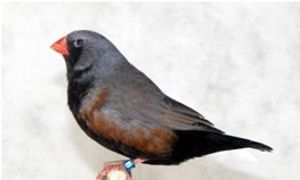 With the development of the Charcoal mutation, we now have three melanistic mutations of the Zebra Finch established in Australian aviculture:- the Charcoal mutation, the Black-faced mutation (1959), and the Black-fronted mutation (1965). 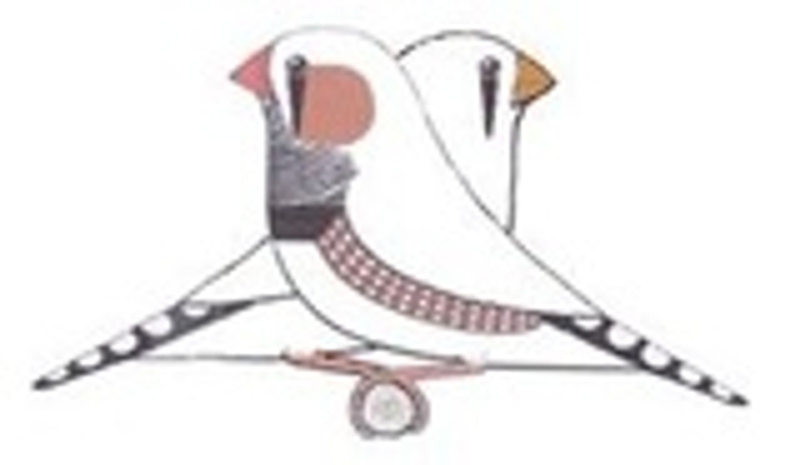 The mode of inheritance for the Charcoal Zebra Finch is autosomal recessive. Adult male: General colour above including wings dark grey; crown of the head and nape of the neck dark grey; rump black; upper tail coverts black, shorter coverts black; tail feathers black; cheeks and ear-coverts dark grey; separated from the bill by a narrow band of black (tears); lores black; throat and upper chest lightly barred black; lower chest, abdomen and under tail-coverts black; flanks dark chestnut brown without spots; bill reddish-orange; legs and feet orange-yellow; eyes reddish-brown. Adult female: General colour above similar to the male; rump black; upper tail-coverts black, shorter coverts black; tail feathers black; cheeks and ear-coverts dark grey separated from the bill by a narrow band of black (tears); lores black; throat, chest and abdomen dark grey, lightly barred horizontally with flecks of black; flanks and lower abdomen dark grey; under tail coverts black. Juvenile: Similar to the adult female, but smaller and slightly duller in coloration; juvenile males more heavily marked greyish-black on chest and abdomen than juvenile females; rump black; upper tail-coverts black, shorter coverts black; under tail-coverts black; tail feathers black; loral region and tears black; bill black. When we acquired our first Charcoal Zebra, no specific name had been applied to this mutation. The small number of people who knew of its existence merely referred to them as Blacks. It soon became apparent that use of the term Blacks would lead to confusion. When someone referred to Blacks, I invariably found myself asking them which of the black mutations they were talking about. The most appropriate name for this mutation would have been the Black-bodied Zebra. Unfortunately this name was already in use to described a variation of the Black-faced mutation. A local Zebra Finch enthusiast suggested that it would probably become known as the Black-tailed Zebra. However, I found this name to be inappropriate too, as it is far more than a bird with just a black tail! Thus began a search for synonyms for the word ‘black’. Over dinner one night we refined our list of possible names to two: - the Sooty Zebra and the Charcoal Zebra. The latter name was preferred as it sounded a little more classy. The first time the name Charcoal Zebra was used with reference to the new black mutation was late in 1998 during conversation with Bill Pope. A short time later I also referred to the Charcoal Zebras during a phone call to Bruce Hockley in Gosford. Since then the name seems to have gained acceptance. I believe it to be appropriate for this mutation. The Charcoal mutation occurred in western Sydney around 1979. In 1981 or 1982 a batch of 20 to 30 Zebras were offered for sale at Bruce Kubbere’s ‘Featherdale Farm’ in Doonside, by an unknown Zebra Finch breeder. Amongst the birds offered were 6 or 7 grey and fawn Charcoals. An employee, Alan Turner, acquired all of the coloured birds. The same day, Turner took the mutant birds to Les Stratford’s place to show him. Les photographed them. He still has the photographs in his possession.They clearly depict the same Charcoal mutation that we are currently breeding. Turner decided to keep the mutation for his own personal collection. Efforts by other aviculturists to obtain mutant birds were unsuccessful. Most aviculturists were unaware that it even existed! One of the first people to gain access to this black mutation was former Wentworthville Pet Shop owner Peter Poole. Joe Gaffa saw Poole’s birds in 1989, just a few days after he got them from Alan Turner. He had a pair of greys, a pair of fawns and a pair of whites, all Charcoals, in the back of his shop. Joe told me of the existence of this mutation in 1992, but it wasn’t until September, 1998 that I saw my first grey Charcoal male in his aviary in Sydney. He informed me that he had purchased it at Allan’s Bird Shop the previous weekend, and that there was another fawn male mutant bird for sale. A quick trip, $20, and it was mine! I knew that I had something different! About two months after I purchased my original mutant, I became aware of the whereabouts of another fawn Charcoal male and a grey Charcoal female in Sydney. I was very keen to gain access to these birds, but so were many others. To a man, they were very quick (and took some delight) in informing me that their owner, Geoff Hemmings, would not part with them. In November, 1998 during a visit to fellow aviculturist and media personality, Don Burke’s home to discuss the captive breeding of the Beautiful Firetail and the Red-eared Firetailed Finch, Geoff Hemming’s name came up in conversation. A phone call was made, and a few days later Geoff phoned me and kindly agreed to lend me the two mutant birds. Now we had three birds to work with: two fawn Charcoal males and one normal grey Charcoal female. 1. To determine the mode of inheritance of the new mutation. 2. To establish the Charcoal mutation as a new Zebra Finch colour in Australian aviculture. 3. To develop a viable breeding strain of normal grey Charcoal Zebras. These were the two birds lent to me by Geoff Hemmings. This pairing was made solely for the purpose of breeding more Charcoals as quickly as possible so that we would have more mutant stock to work with. This pairing was not successful. Three successive clutches of five eggs were layed. Of the fifteen eggs layed only two were fertile. A young grey Charcoal male and a fawn Charcoal female were produced, but both died before reaching maturity. The pair was separated. From this pairing we expected all the young to be fawn; with some males and some females displaying the Charcoal features of the male. This proved to be the case. The expected breeding results from this pair were as for pairing three. Once again some fawn Charcoal males and females were produced. This was our most important pairing. From this pair we expected to produce our first grey Charcoal males and females. This proved to be the case. Fawn Charcoals and fawn split and grey split Charcoals of both sexes were also produced. Now we had a small number of grey Charcoal females, vital for the development of a strain of grey Charcoal Zebra Finches. This pairing was not planned. It produced Charcoals along with normal looking greys and fawn females, some of which were split and some were not. Although not a particularly useful pairing if you already have mutant birds, it did demonstrate that both sexes are split for Charcoal. Six of these pairs have now been put together specifically to try to produce a few more grey Charcoals of both sexes. Especially the grey Charcoal and grey split Charcoal females needed to develop the strain of grey Charcoal Zebras. Theoretically 50% of the females bred should be grey, but this has not been the case. Less than 25% have been grey. This pairing has been made with a very large fawn female bred by Paul Clarke, in an attempt to add size to the next generation of fawn Charcoals. Two of these pairings have now been made to breed more grey Charcoals. If any fawns appear they will be females. Any grey Charcoal males bred could be split for fawn. In order to develop a line of grey Charcoals we need grey Charcoal females or grey females split for Charcoal. We needed to make pairings to produce the grey females that we require. We decided to outcross the small number of grey Charcoal females that we have bred to good quality grey males. Outstanding greys (males and females) were obtained from Grant Bastin, Bill Sewell and Ron Weal. The pairings were made, and to date we have bred 9 grey split Charcoals, including five grey split Charcoal females. We are now on the way to developing a very nice strain of the beautiful grey Charcoal Zebra Finch. At the end of November, 1999 we had produced nearly 80 birds carrying the Charcoal genes. The above is a simple recount of what we have achieved to date in our breeding of the Charcoal Zebra Finch. Obviously other aviculturists have bred this mutation prior to our association with it. It is up to them to record their own data. Since the acquisition of our first Charcoal Zebra Finch some fourteen months ago, we have concentrated on establishing it in numbers sufficient to ensure its continued presence in aviculture. I believe that its position should now be secure. We have also determined the genetic mode of inheritance for this mutation. Henceforth, our breeding program will focus primarily on the development of a stud of quality grey Charcoal Zebra Finches. The following people (in alphabetical order) have unselfishly provided, birds and data needed for this breeding program to succeed:- Grant Bastin (Sydney), Paul Clarke (Newcastle), Joe Gaffa (Sydney), Geoff Hemmings (Sydney), Bruce Hockley (Gosford), Bill Pope (Newcastle), Bill Sewell (Bathurst) and Ron Weal (Bathurst).